Gunmen in Bangladesh have shot dead a lawyer who prosecuted six militants who were hanged two weeks ago. Haider Hossein was killed as he came out of a mosque after prayers near his home in the southern Bangladeshi town of Jhalakathi, police said. He was a special public prosecutor in the case of the murder of two judges during a wave of bomb attacks in 2005. The hanged militants included Abdur Rahman, the head of the banned Islamic group Jamaatul Mujahideen Bangladesh. 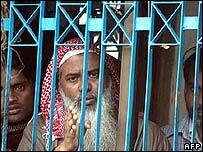 His deputy Siddiqul Islam, known as Bangla Bhai, was also executed. Jhalakathi police chief Habibur Rahman said Mr Hossein died on the way to hospital. "He had sought security from the district authorities after receiving a threat on Tuesday," Mr Rahman was quoted as saying by the AFP news agency. Mr Rahman said police were investigating the murder, but would not comment on who was involved in the case. "Right at this stage we cannot say whether it was the work of JMB (Jamaatul Mujahideen Bangladesh). We also haven't ruled it out," he said. 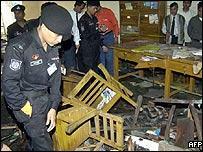 The November 2005 attack on the judges was part of a series of bombings for which the JMB was blamed. During their trial, the men said they targeted the judiciary because it was run by secular rather than Sharia law. The Supreme Court rejected their appeal late last year and President Iajuddin Ahmed turned down a request for clemency earlier this month. JMB has been blamed for a string of bombings across Bangladesh that left almost 30 people dead. In August 2005, some 500 bombs were set off in all but one of Bangladesh's 64 districts in the space of an hour. A number of subsequent bomb attacks targeted judges and courtrooms. More than 100 cases were filed against alleged members of the JMB in connection with the campaign.